In Part 1 I discussed three categories of questions: 1) God defines effectiveness in evangelism. 2) Theology determines methodology. 3) Evangelism is a ministry of the church. Within this blog post I’ll be focusing on another few categories: 1) Evangelism is a ministry of the church. 2) Street evangelism and love. 3) Street evangelism applied. This category gets a sequel. Too often evangelism is isolated to a personal task and congregants aren’t held accountable for their evangelism. 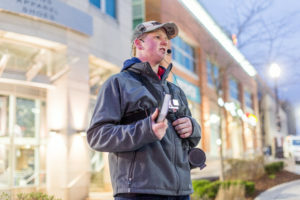 A street evangelism ministry promotes an evangelism culture within the church. Why is a street evangelism ministry necessary if it is the responsibility of all Christians in the church to evangelize? All Christians have a responsibility to evangelize. Yes, Amen! However, is it not dangerous to assume evangelism is happening throughout the week? Some have rightly said that we cannot assume the Gospel, but we must intentionally preach the Gospel. In another way it is also important to not assume Christians are sharing the Gospel. Regular corporate intentional evangelism is important. Don’t assume evangelism is just happening. Intentional discipleship matters. How do I know if the ministry is successful? Are you determining success based on pragmatism (what seems practical), something else, or the Bible? The pragmatic paradigm is judging effectiveness based on the immediate perceived results. This would mean equating higher numbers based on decision cards for Christ, people at a church service, or views on social media as a mark of greater success. This is dangerous. It can create a false sense of success when perceived results are achieved, and despair when perceived success isn’t achieved. The pragmatic paradigm has hindered evangelism. Biblical faithfulness, which is sharing the Gospel and inviting people to believe it, must always be the measuring stick. An evangelism ministry will only be successful to the extent that it aligns with obedience to Christ as revealed in Scripture. What are some of the pragmatic reasons for a street evangelism ministry within the church? 1. We live in a secularized generation. Many people under thirty did not and are not growing up going to church. They are ignorant to basic Christian words and Christian truth. Going to church is not on the radar. Christians must go to them. 2. There are many coming from other countries to Canada. A few weeks ago, I talked to a few students from India. They had a limited understanding of Jesus. Many will be coming from other countries to Canada with little to no understanding of Christianity. Christians must go to them. 3. Our individual capacity is limited. By saying you must develop a certain level of relationship with people to share the Gospel is to say that most people can simply go to hell. How many people are in your community alone? Do you have the capacity to invite all of them over for dinner? Get to know all of them well? You don’t. None of us do. So, what about everyone else? How will they hear without a preacher? Christians must go to them. The proclaimed Gospel is an act of love toward a godless culture. I struggle to love as I should. Each of these questions I’ve asked at some point. I needed to and continue to need to repent of my lack of love. What if I’m too shy to do street evangelism? Being shy seems to be rarely used as a negative. However, if I disobey God in the name of being shy it’s sin. My identity is in Christ not being shy. There are times when being shy is sin and thus sometimes being shy needs to be repented of. This doesn’t mean “thou must do street evangelism.” However, if you have the opportunity then why wouldn’t you want to? If you can hand a clerk money to buy a product, why wouldn’t you be able to hand someone a Gospel tract that can give them salvation? Our identity must be in Christ. We must love Christ and love others. What about the street evangelists that are hateful? I acknowledge that there are some hateful street preachers, but I also know many will twist the words of a godly street preacher to wrongfully paint him as hateful. It is also important to recognize that all Christians, even the street preacher (if he’s truly born-again) is growing just as you and I are. So, I’m not as quick to label street evangelists as hateful. I’ve had times that I’ve wrongly thought someone spoke too strongly and lacked charity and likewise I’ve had some think this of me (justly and unjustly). Here are some reflections that may be helpful for when this kind of situation occurs. One, do I view the person as speaking too strongly because I don’t feel the weight of their concerns as I should? Two, do I view them as uncharitable because of my own limited knowledge on the subject and therefore I merely view them as harsh based on my ignorance? Three, is what they are saying true? I may not like how it is said, it may cost me something personally to acknowledge what they are saying, but is it true? Four, how has my culture, background, and people I hang around with influenced my objectivity in evaluating someone as being too strong or uncharitable? Fifth, do I simply not like what is being said or the implications of what is being said and therefore I deflect the topic? Sixth, even if the person is objectively uncharitable after I have thoroughly examined the situation, is there something I can learn or a hint of truth that can be rescued from what they are saying? Seventh, are my standards for critique biblical? Finally, regardless of others, am I bringing glory to Christ in my response? These are questions to ask before presumptuously and possibly hypocritically judging someone else as too harsh or hateful. Before I started doing street evangelism I was a hypocrite who was critical of others (wrongly and rightly) without striving to set a better example. Let’s avoid boasting about how much nicer we are in comparison to others and simply set a better example. We must love Christ and love others. Isn’t street evangelism just people having arguments? Where is the love? It is important to define terms. Is arguing always wrong? No. Can it be an act of love at times? Yes. For the sake of love confrontation and non-confrontation must never be elevated above truth. If I’m honest I know that sometimes I’ve used this argument as a mask for my lack of love. It is easier to divert the conversation to subjectively being critical of others on secondary matters verses accepting the implications of what the truth means for my life. Love will embrace confrontation when needed (its needed more than we think). Love will be non-confrontational when appropriate. We must love Christ and love others. What is helpful to watch out for in conversations? A) I brought up a biblical argument toward the Jehovah’s Witnesses that contradicted their views. The man’s response was that we are to interpret scripture with scripture. This is a tricky thing to respond to. The Jehovah’s Witness is right on this point. They are saying something that no Christian should disagree with. They are using agreed upon language. However, that is what makes the argument all the more tricky. They are assuming their beliefs into the statement of interpreting scripture with scripture. For they are saying something that is true but are doing so to avoid the biblical argument that contradicts their view. In other words, they are not using scripture to interpret scripture. They are using scripture to avoid other scripture, in this case, scripture that contradicts their view. The Jehovah’s Witnesses then dismiss dealing with specific texts and their specific contexts by using an agreed upon statement of interpreting scripture with scripture. B) I’ve heard strong advocates of political correctness ask, “are you open to learning?”. This is a tactic designed to trap you and ironically to disengage from learning. If you answer, yes, then their ideology is the answer for your ignorance. If you say, no, then you’re a closed-minded bigot who will not be tolerated in the name of tolerance. False teaching is embraced because it usually uses nice sounding words or phrases people don’t disagree with. This is done to hide the godlessness going on behind the scenes. In any case, it is important to challenge the assumptions built into the question. Define terms. Lead the conversation. Point to the solution, Jesus Christ. 2. Imagine if a football team kept gaining ten yards every time they ran the ball. They would constantly be getting first downs until they eventually score a touchdown. If the opposing team didn’t like this and encouraged the successful team to not run the ball so much, how would the successful team respond? Most certainly not by changing their working tactic. They’d keep running. When you have someone cornered on a foundational point in conversation it is important to hold your ground. Don’t move away from it, even if it means the conversation is over. Too many Christians in conversation will let the unbeliever be consistently inconsistent, then expect the unbeliever to embrace Christian consistency at the end. The result is a frustrated Christian who feels like they talked about a hundred different topics, but the conversation didn’t go beyond the surface. Remember, just because the unbeliever doesn’t accept your position it doesn’t mean it isn’t the right position. Sin causes people to be irrational. As you study and learn other beliefs do so with the intent to get to the core of what matters. Understand the inconsistencies of other beliefs and use this to intentionally flow the conversation to the Gospel of Jesus Christ. What should I be aware of if I run into other Christians? Don’t assume they’re a false convert because you don’t know them. Don’t assume they’re a Christian because they call themselves a Christian. Kindly ask questions about their salvation experience, understanding of the Gospel, and the church they attend. Great questions give good information. Good Information brings clarity. Clarity helps to produce a godlier response to the individual you are speaking with.